You’ve found it. The mother of all olive salads. 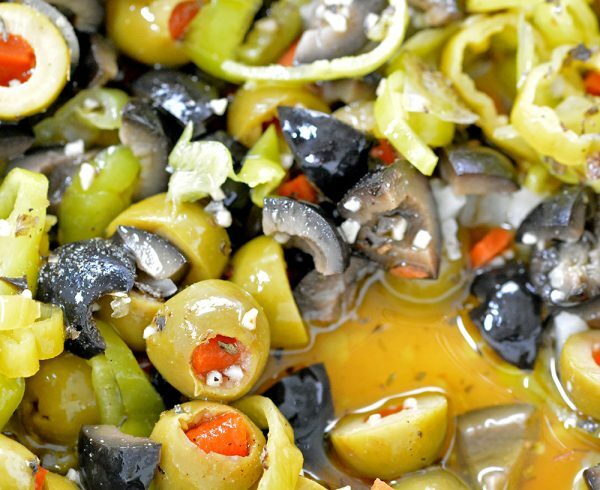 You’ll want to sit down with a spoon and eat this olive salad as is. We admit. We’ve done it. Several times. It didn’t even make it’s way on top of the muffaletta sandwich we made it for. Oh well. As is life. 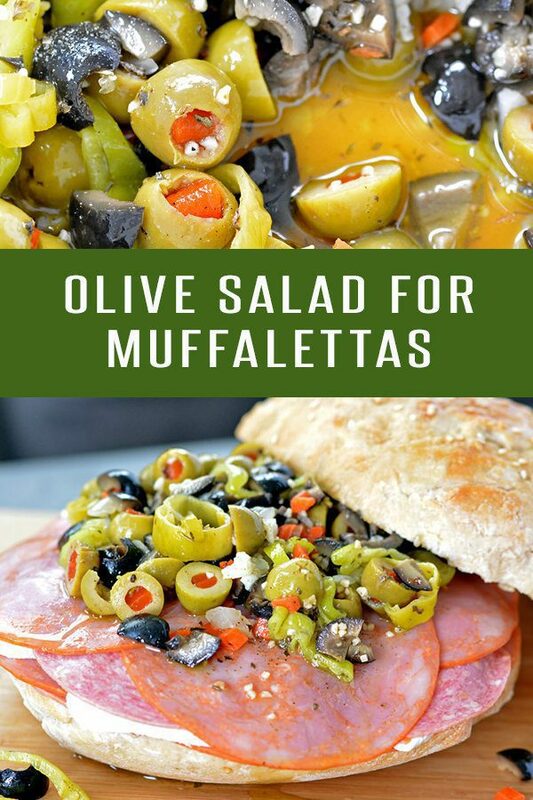 While we’re on the topic of Muffaletta Sandwiches…..
A key component to a traditional Muffaletta Sandwich is the olive salad. We’ve been playing around with different combinations and landed on one that reminds us of the Central Grocery Olive Salad. 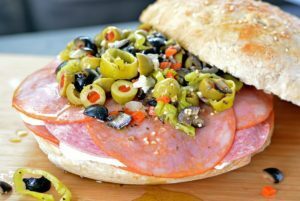 Make It A Meal: This Italian Olive Salad pairs perfectly with our Muffaletta Sandwich and Muffaletta Bread. While not required, it’s best to make this 24-hours in advance in order to mingle flavors. Just leave it in the fridge until you’re ready to eat. 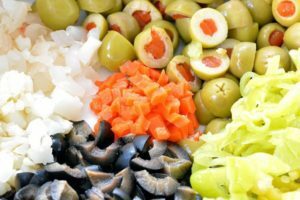 There are prepared pickled vegetables you can buy instead of making them yourself or buying them one by one. 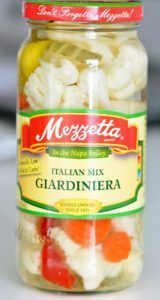 If you live near New Orleans you can probably find a popular brand from the region (such as Boscoli Italian Olive Salad), however if you don’t live near New Orleans your best bet is Giardiniera. We just pick out the individual veggies as we need them. PLEASE. PLEASE. PLEASE. Use high-quality olive oil. You will taste the difference if you use an inferior brand. We like to keep our olives nice and chunky. If you prefer a smaller chop, stick the mixture in a blender and do a quick pulse or two to get it to your desired consistency. Traditional Olive Salad to pair with our Muffaletta Sandwich. Crush, slice or dice the green and black olives (your preference) and add to a large bowl. Add the garlic, picked vegetables, celery salt, oregano, basil, pepper, red wine and olive oil and combine. Transfer the bowl to the refrigerator and let sit overnight. Adapted from this AllRecipes recipes.